This K-Adult language arts series provides opportunities for critical thinking, problem solving, and decision making through reading and comprehension. Topics include facts/opinions, organizing ideas, word meanings and proper usage, logic, understanding prefixes and suffixes, inferring, hypotheses/conclusions, and values. The advanced level features important documents (Magna Carta through the Bill of Rights), Thinkers and Visionaries (Socrates through Steve Jobs), Famous Authors (Aesop through Crichton), Historical Events (Industrial Revolution through Medical Advances), and Vital Speeches (President Washington through President Obama). Level 1A: Phonics - Reading Readiness provides instruction and practice in the rules and sounds of vowels, consonants, and their pairs. This program prepares the student to advance to basic vocabulary and reading lessons in Reading Level 1. 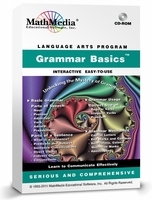 Grammar Basics: The MathMedia Grammar Basics� program emphasizes the language skills that will meet the student�s present needs in writing and speaking and also provide a foundation for more advanced language courses and foreign language courses. Learning the fundamentals of English grammar and usage are necessary for proper writing and speaking. This program, therefore, stresses the important basic grammar and usage skills. On demand audio is included for the entire program. 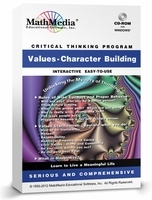 Values - Character Building The latest addition to the Reading and Thinking Series provides reading comprehension practice while thinking about the "Rules of Wise Conduct & Proper Behavior", qualities of respect, responsibility, and leadership traits, and "What is Happiness?". A comprehensive list of subject matter for each program can be found by clicking on the respective links below. These programs automatically �bookmark� the student�s last viewed screen and will prompt the student to return to that screen upon their return. These programs are part of that learning process for grades K-Adult and English for Speakers of Other Languages (ESOL). These programs can be used for young students preparing for standardized tests and high school exit exams as well as adults who are learning English and/or preparing for the GED or TABE. 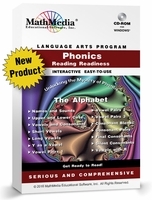 "Media Type (Windows)" "CD" "USB flash drive" "Downloadable Link" "Online"
Purchase the complete set of Phonics, Reading Levels 1-3, Grammar, and Values for $189. For school site licenses and multiple user options click here.